Well, spring is in the air, the snowdrops are gambolling in the meadows, the lambs are thrusting their little noses up through the earth, and the rabbits... I don't know what the rabbits are doing. Something springish. Cleaning, maybe. Anyway, what all this means for me is that it's about time I organised another run of my sort-of-secret-unless-you-read-this-blog sketch nights, to try out material for the next series of my Radio 4 show, John Finnemore's Souvenir Programme. So... I have done. Unfortunately, the pub we used last year has turned its performance space into a restaurant, the food-crazed fools; but I've found another I think will be even better: the excellent Priory Tavern in Kilburn. So, do please come along, if you fancy it, to John Finnemore's Priory Engagement; 8pm every other Sunday starting in two weeks time, on the 18th March. Each show will be completely different material, mostly written in the fortnight before. It'll be about an hour and a half long, including interval, costs £7, and is suitable for ages 12 and up. Last year's run featured Jekyll and Hyde's domestic arrangements; what The Archers sounds like to people who don't listen to The Archers, and the chilling tale of the man who went for a walk... and saw a goat. What this year's will feature, I literally do not yet know. As an experiment to try to avoid people having to pay the ridiculous booking fees which were such a feature last year, I've put a list up here you can go to to book seats for the first three performances. There are only 80 seats per show, so do please take your name off again if it turns out you can't come. Five year diary being consulted plus working out the military-like logistics for travelling from Essex to Kilburn and back on a Sunday evening courtesy of British Rail and London Transport, bless their cotton socks. The Little Train That Could- I hope! Remind me why I live north of the border?! 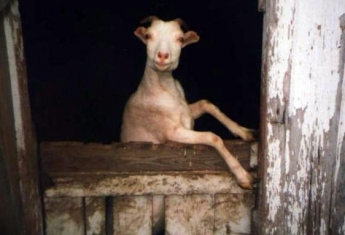 LOL, A goat, we love goats over here on the farm. Not for the first time, or I fear the last, I really wish I lived in / near London just for things like this! I loved the Goat Story in the first series. Makes me glad I have an Eidetic Memory! Bother! I wish I still lived in the UK. There's nothing exciting live over here in Canada - everything exciting is dead and displayed as a hunting trophy. I'm so envious of people who live in Britain. They have decent telly, proper radio, nice food etc. and from what I gather, they aren't grateful for it! Oh dear, how I do dislike living in the US. Alas, finances (me) and work commitments (other half) make it impossible; I'll hang on and join the ballot for 'Cabin Pressure' tickets again later in the year - fourth time lucky, maybe? Another person who can't afford the fare and can't do the journey on a Sunday evening, sorry. However, I don't think you'll be short of an audience! Wish you every success and we'll look forward to hearing the broadcasts. You're right, Anonymous, it is ticket unit applications but also a ballot in that I think they are allocated "first come, first served". You never know your luck though, I applied last year never expecting any results but was amazed & thrilled to get tickets for what turned out to be "Rotterdam". Still, I'm very excited to hear there's a new series and will definitely be listening. Can't believe I'm actually coming to see you! Four weeks and counting. Yay! In comparison to some, Oxfordshire is positively close and yes, we'll be there, although sadly only on one of the nights. I'm hoping to bring at least 3 others so you better be good Mr. F or there'll be trouble. p.s. we now play yellow car on foot too, how sad is that. We need you to do this in the USA!!! Have you seen this? I can't take credit for it but it made me weep with laughter. "has finally come about as much influence" he's in there somewhere I promise. great john! we have booked! Good luck writing and trying out the new material! Should be hilarious, based on the first series. As an aside, if we in the US want to see the show, then surely it's time for us to bring John over here? If we book a theatre in the middle of the country, like Wichita, then the most anyone has to drive is 1500 miles! (OK, 1800 from Maine or Seattle.) Who's in? Ooh, yay. Sunday evenings will be difficult but as one of the days is during the school holidays, I should be able to make it at least once. If only I lived in the UK, darn this pond known as the Atlantic Ocean! Good luck with the show! I knew there was a reason I divorced my husband and gave him custody of the kids on Sunday nights! Finally it's all become clear. Only joking, you got Jimoen in exchange! Oh, why do I only see that now? I live far, far away, but I'm actually spending the week around the 1st of April in the UK. In Sussex. An hour from London. I could easily come. But of course that one date is booked out already. My luck! Well, I'll try to not let that get me down and instead think of all the times this blog and your radio shows have made me insanely happy. Thank you, Mr. Finnemore, for being just... brilliant! Wow, you know what is incredibly awkward? Trying to be sneaky and being to stupid to do so. As in slipping your e-mail adress in in your comment showing how desperate you are for a ticket, in hope someone will take pity on you and give you their ticket if they can't come or something. Which of course is all silly enough, but then typing your old, invalid e-mail adress tops it all. And I guess owning up to it, doesn't make the whole thing any less stupid, silly or desperate. But there you go, that's fan-girlishness for you. I'm gonna go now, hide somewhere, maybe listen to some Cabin Pressure until I stop sobbing. How does the expression go? You lose some... don't you? Oh well, I'll try and stop being whiny and annoying now. And to be fair, life and the world are actually quite lovely to me at the moment. It's lovely and sunny outside and I saw my first bumblebee of the year today AND I am going to England in a few weeks. So, life is good. It won't work, will it? Life is very good, indeed! Anon in hull, you are the best! Jake - don't worry, I've got the email addresses of everyone who put their names down, and if any names disappear I'll check with them that they took them off themselves. Cai and Anon in Hull - Excellent - glad that got sorted out! I am the man in this photograph of me. Writer, comedian and actor. I wrote Cabin Pressure, and now write John Finnemore's Souvenir Programme, and Double Acts. More of this sort of thing. An almost entirely unhelpful index.